Create your own, personal bubble of clean air and take it with you wherever you go. 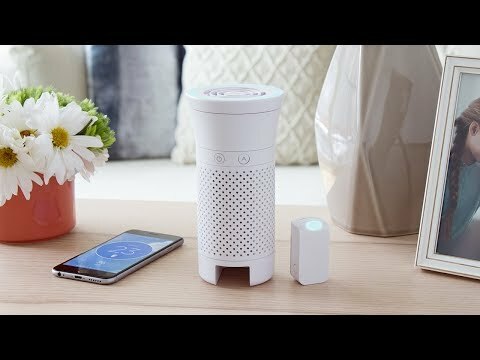 This personal air purifier removes dust, allergens, smoke, and pollution, and even helps you track when you might need to use it. You adjust the air quality manually to whatever feels comfortable—or leave it to the tracker to choose the appropriate level automatically. Wynd is small enough to keep at your desk or slip into your car’s cup holder. 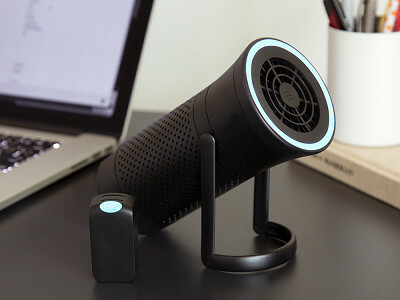 When it’s on, it delivers nine liters (a three-foot radius) of purified air. And its included tiny tracker changes colors and pushes notifications to your phone to warn you if the surrounding air is unhealthy. You can slide it into the bottom of the purifier or clip it on to a purse or backpack to use it independently when you’re on the go. 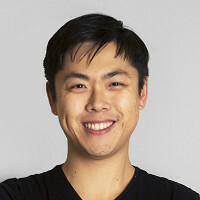 Maker Ramond Wu wanted to create something that would not only help people breathe cleaner air, but would also help them understand when the air around them is unhealthy—which is often difficult to detect. People take around 20 thousand breaths every day. With Wynd, we can make sure more of those inhales are fresh and clean. Can you provide a more concrete definition of what amount of "personal space" gets the improved air quality from the purifier and the "bubble" of clean air that it creates? The definition of personal space and bubble would be three feet in radius from the device. We've found Wynd to be most effective at cleaning pollutants, allergens, and germs in this area. Use case settings would include on your desk while you work, in your car while you drive and sit in traffic, on your nightstand while you sleep, on the airplane tray table while you travel, etc. Can Wynd clean a room? The simple answer is yes, though we advise that it’s more effective for enclosed smaller rooms (10 x 10 ft). To make Wynd even more effective, you can also aim it at you using the included Kickstand. The clean air that’s generated gets funneled directly toward you so the user can breathe clean air immediately. How do I care for my Wynd? Replace the filter approximately every 3 months or when the app alerts you to do so. How long does the battery last and is it rechargeable? Yes, Wynd is rechargeable. It has about 8 hours of battery life with normal use. Create your own, personal bubble of clean air and take it with you wherever you go. 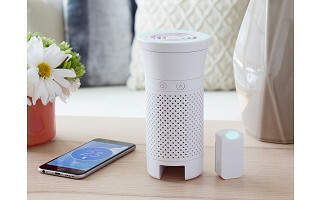 This personal air purifier removes dust, allergens, smoke, and pollution, and even helps you track when you might need to use it. You adjust the air quality manually to whatever feels comfortable—or leave it to the tracker to choose the appropriate level automatically. Wynd is small enough to keep at your desk or slip into your car’s cup holder. 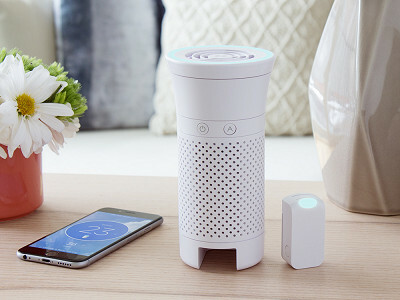 When it’s on, it delivers nine liters (a three-foot radius) of purified air. 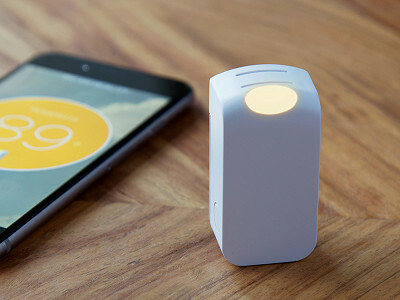 And its included tiny tracker changes colors and pushes notifications to your phone to warn you if the surrounding air is unhealthy. You can slide it into the bottom of the purifier or clip it on to a purse or backpack to use it independently when you’re on the go. Maker Ramond Wu wanted to create something that would not only help people breathe cleaner air, but would also help them understand when the air around them is unhealthy—which is often difficult to detect.